Tag Line: Love, Life, Education!? Most anime are based off of some form of previous media from Japan when they are created. Now the benefit of creating an anime that was based off of a popular manga or light novel offers a number of advantages. Occasionally the anime will be created shortly into the other media’s life which means that there are often a lot of filler episodes which detract from the end product. Sometimes this is not the case and Honey and Clover is an example of that. Now Honey and Clover was created as a manga originally by Chika Umino back in 2000. An anime was then produced by J.C. Staff in 2005, a full five years into the publication of the monthly manga. Now Madman Entertainment has brought the series to Australia. 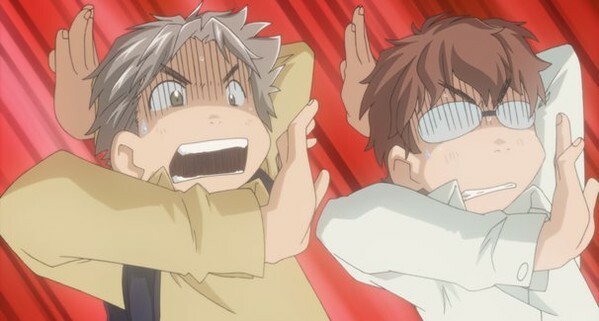 With its slice of life basis with a mix of drama, romance and comedy placed into the kiln does Honey and Clover offer fans of those genres a true piece of art? The story centers around five different characters who happen to all be attending an art college in Tokyo. Three of these characters are Yūta Takemoto, Takumi Mayama and Shinobu Morita. All three of these men live in the same apartment complex as one another. Despite the quirks of Shinobu they manage to make it through as well as college students living on their own can imagine. Now one day they are introduced to a young girl named Hagumi Hanamoto who is related to their art professor Shūji Hanamoto. Hagumi is a first year student but happens to also be an artistic genius. Things would normally carry on as though nothing ever happened, except both Yūta and Shinobu fall in love with Hagumi at first sight. Despite these two being “friends” a love triangle has formed between the two. While Takumi may not have fallen in love with Hagumi, he has problems of his own. Ayumi Yamada, a woman also attending the art school in the field of pottery, happens to love Takumi even though Takumi does not reciprocate her feelings; instead he is in love with his boss Rika Harada, forming yet another love triangle. The story then follows these five characters as they try to sort out their feelings and make their way through their college lives and graduate. Now it is worth taking note that this is only the first collection of 12 episodes from the original 24 episode series, meaning that the storyline doesn’t truly wrap up at the end of the last episode, instead carrying into Collection 2 which will be released by Madmen at a later date. Moving on from that the first twelve episodes help lay the ground work of the rest of the series by introducing the characters and situations to the viewer and providing enough time for viewers to understand each character. 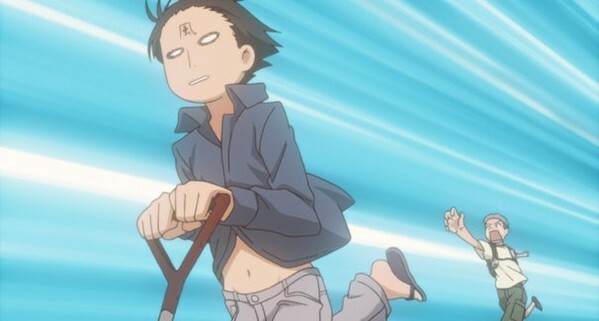 There are a number of times that viewers will truly feel for the characters in the series thanks to the great writing that is employed in Honey and Clover. The writing goes into great detail about how each character manages situations in their lives, from their art to how they deal with love and friendship. To add more fuel to the emotional fire the topic of unrequited love and the impact this can have on the person not having their feelings returned by the one that they love. Being a comedy series there is always the problem of balancing how much comedy can be thrown into an episode without it feeling like it is hindering the development of the story as a whole. 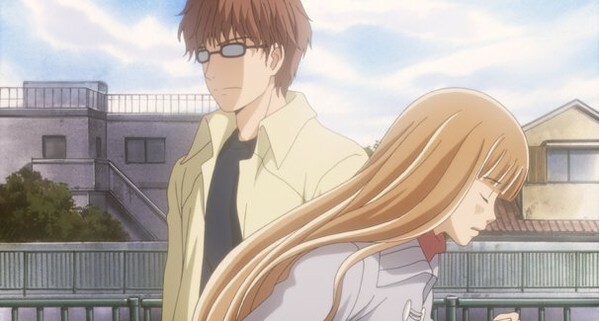 Honey and Clover manages to balance these relatively well as the series moves on but the first few episodes of the series may leave viewers questioning if they wish to continue watching the series due slow plot development. These episodes construct the base that the rest of the series stands upon but they are unfortunately rather sluggish to get going despite having comedic elements mixed in. The comedy that is employed by Honey and Clover manages to present an enjoyable viewing experience with plenty of moments that I found myself laughing too. These comedic moments often come from the absurdity of a situation and the interactions between the characters. Whether it is Ayumi’s axe kick being unleashed or Shinobu’s schemes that place the rest of the characters in funny situations the series does produce enough laughs to be enjoyable. The visual style used by J.C. Staff is something that isn’t often seen any more in most mainstream anime. The anime style uses softer color choices and attempts to stay true to the original artwork that one may find in the actual manga series when it was being published. The overall look makes the series look like it is older than it actually is but creates a nice atmosphere for the themes that are focused on during the story. The artwork that the characters design is impressive to say the least and helps hammer home the fact that they are all following various degrees in an Art School. Now the character designs can be hit and miss. Each character doesn’t really have a whole lot of features that set them apart from each other besides overall appearance and outfit due to the simplicity of the coloring. The animation is a bit dry and considering the anime is based around the feelings of the main characters there are many times that the scene will shift into an obvious “emotional moment” that is highlighted by a shift in background for no reason than to simply punctuate the moment. Plus the series has a tendency to use chibification often, usually implemented into the comedic moments of the story which can sometimes help provide a laugh on their own but can also be tiresome when overused. Now although I just mentioned that the characters don’t have a whole lot to set them apart visually, one character does have stand out most obviously and this is Hagumi. Now Hagumi is supposed to be an 18 year old girl, but she is also extremely tiny in appearance. She is more than just tiny however she is basically a loli character that easily passes as a child under the age of ten years old. When this factor is tied in to the fact that Shinobu and Yūta both develop feelings for her, it does raise a creepy flag. Honey and Clover sports a musical soundtrack with most songs being simple low-key affairs that focus on accentuating the dramatic moments happening on screen at the moment. The ending sequence, “Waltz” that often plays a few seconds before the ending animation begins is unimpressive and can be easily forgotten. While the opening song “Dramatic” is a little bit better, it is still the most memorable opening sequence you will come across. The reason for this is that the entire opening features a green background with a plate in the middle of said background. The plate will then have different pieces of food placed on it through stop motion. Each piece of food depicts something other than what it actually is, such as a hot dog man or dancing spaghetti and is quite impressive to see. Also better watch out for shrimp. Honey and Clover comes with both the original Japanese dub and the new English dub so it is up to you on which you choose to listen to. As for the English voice actors they do a great job voicing the characters and Hagumi was especially a highlight to listen to as her voice matched her small stature perfectly. As in any slice of life anime, the quality of the show resides in how strong the characters turn out to be and how well they interact with one another. Honey and Clover has an extremely strong cast of characters that meld well with one another and not a single one of them seems out of place in this stellar cast. Yūta Takemoto who can be seen as the main character of the story is perhaps one of the best examples of a student in college who has to struggle through life. He has multiple insecurities as one would expect from a student who is far away from home and is trying to find out who he really wants to be, especially when you add in the fact that he has fallen in love for perhaps the first time with Hagumi. He is a very subtle character who likes to keep his emotions mostly to himself which can cause the viewer to grow frustrated with his actions as he doesn’t usually act on his feelings. The viewer is given a taste of his inner turmoil and inability to express his feelings for the girl who is more important to him than anyone else in his world. Hagumi Hanamoto is a small girl who is a very artistic girl but her artistic side has a downside to it. Thanks to often being wrapped up in her work she is very shy and has trouble socializing with those around her. This lack of interaction makes it difficult for her to make any friends as they often only see her as an artist with sculptures around the world in art museums. Her childlike stature makes her the object of Shinobu’s get rich schemes. Hagumi can be hard to relate too and her small stature can leave the audience questioning what her age really is, considering the anime itself seems to forget her age at times as well. Perhaps one of the most comedic men in the series is Shinobu. He often disappears from the apartment building for many days at a time and doesn’t attend school only to return with a wad of cash. He is extremely eccentric and easy going in life but exhibits amazing artistic talents at the strangest of times, while also being completely spontaneous. Shinobu often thinks up get rich quick schemes, and takes advantage of Hagumi’s small size to create artwork for himself. Despite his immature personality Shinobu is affected by Hagumi greatly and has difficulties actually understanding his own feelings which are different from Yūta who simply can’t express himself. Wrapping up the rest of the cast we have Takumi Mayama who appears to be the most mature of the group of friends. He is the most reliable and understanding of them all and can be seen as an older brother to Shinobu and Yūta. There is a strange side of him however that causes him to fall in love with his boss, despite his unwilling nature to express how he feels about her. Takumi is the object of Yamada Ayumi’s affection however, leading to the second love triangle. Yamada is the character of much heartache in the series as she expresses herself much more openly than the rest of the cast. Yamada is also called Iron Man by her classmates due to her daily training when she was younger and often expresses herself with violence. Honey and Clover Collection 1 doesn’t come with just the twelve episodes but also a handful of extras. Before I mentioned that the opening sequence was probably the most unique thing you will ever see and this is true. So much so that they provided an extra feature that shows how the foods were created and how they created the opening as a whole. Also on each disc is a Cultural Reference guide which explains various Japanese terms which may not be understandable for first time anime viewers. Besides a clean version of the opening and ending sequence a bonus episode was included in the two disc collection. Titled Chapter L it follows the characters’ dealings and remembrance of a character named Lohmeyer which is entirely separate from the storyline but is a nice little bonus feature. Many anime titles struggle with the concept of love and how it develops. Most of these titles simply focus on one on one relationships or a harem type with every girl throwing herself at a central main character. 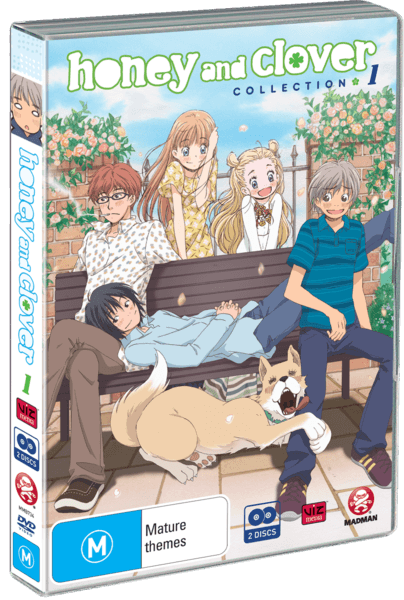 Honey and Clover places itself leaps and bounds above the rest of these anime and creates not only an enjoyable piece of romantic comedy but plenty of drama at the same time. 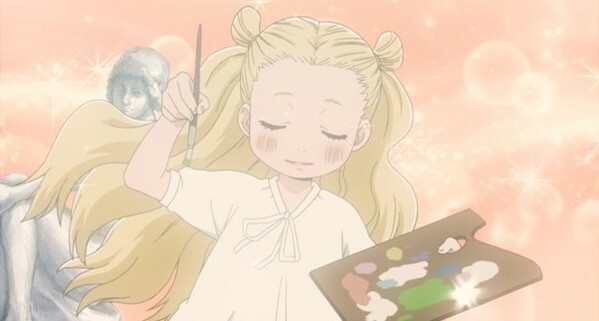 With a unique art style not often seen today, Honey and Clover is certainly worth a watch and I will be greatly anticipating the second Collection of episodes.